Sagar Tolani 2 years, 3 months ago. Here is the much awaited Nougat 7.0 ROM for Nexus 5 CyanogenMod 14 (CM14). We alsos have the Lineage 14.1 for Nexus 5. For latest updates, stay tuned to the Lineage OS 14.1 device list page. In addition to this here is the OFFICIAL Nexus 5 CM14.1. You can also try the BOKROM AOSP 7.0 Nougat ROM for Nexus 5 or the AOSP Nougat 7.0 ROM for Nexus 5. 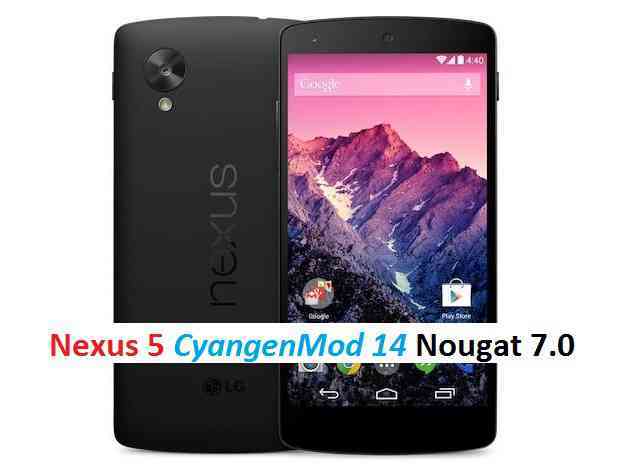 This Nexus 5 for CyanogenMod 14 is brought to you by developer Lycoris and another build is by Santhosh. In addition to this CM14 for Nexus 5 here we have a collection of Nougat ROMs for Nexus 5. Since Google released Android Nougat Source code, we have update many Android NOUGAT AOSP ROMs and also many CM14/CyanogenMod 14 ROMs updated and many are yet to come. Installing a custom ROM on a the Nexus 5 may require the bootloader to be unlocked on Nexus 5 and a Custom Recovery on Nexus 5, which may VOID your warranty and may delete all your data. Before proceeding further you may consider backup all data on the phone. You are the only person doing changes to your phone and I cannot be held responsible for the mistakes done by you. ALSO KNOW THAT THIS IS A DEVELOPMENT BUILD AND CONTAINS MORE BUGS THAN YOU CAN THINK. Bootloader unlock guide for Nexus 5 and TWRP recovery installation on Nexus 5 (hammerhead). Download and Copy the Nougat GApps and CyanogenMod 14 Nougat ROM ZIP to Nexus 5. First flash the Nexus 5 CM14 ROM ZIP from device. Reboot and Enjoy the CyanogenMod 14 Nougat ROM on Nexus 5. Copy the CM14 ROM ZIP file to your phone. Flash the latest CM14 ROM ZIP from your phone. Stay tuned or Subscribe to the Nexus 5 forum For other Android Nougat ROMs, CyanogenMod 14 ROMs, other ROMs and all other device specific topics. Development thread for Santhosh’s Nexus 5 CM14/CyanogenMod 14 Nougat 7.0 ROM is here. Download link for ROM not working. Hi Tim, can you try downloading from the Texas Mirror link. I was able to download from Texas link. I use cm13 on my nexus 5. Thanks for this ROM. If I use it, can I update with OTA? Tried installing from clean. Shatosh version with micro gapps – I couldn’t add a google account. Everytime the phone tried to start google play services to add an account, it crashed with a”google play services has stopped” error. Clearing cache, trying to sideload an APK, using a different open gapps didn’t seem to help. Trying the Lyoris version now. Could you please let me know how and where I can report some bugs detected in Nexus 5 CM 14. Hey buddy, any update on GApp? i cannot get gapp’s too. Based on Android version you need to select the GApps. For CM14.0/Nougat 7.0 you need to download GApps 7.0 and for CM14.1/Nougat 7.1 you need to download GApps 7.1.